Citation: Venyo AKG. Rhabdomyosarcoma of the testis, epididymis and spermatic cord: A review and update. Pulsus J Surg Res. 2018;2(2):78-86. Background: Rhabdomyosarcoma of the testis, epididymis, spermatic cord and rhabdomyosarcomas that are classified as para-testicular rhabdomyosarcomas tend to be rare and sporadically reported; hence many clinicians may not be familiar with the biological behaviour and management of the disease. Aim: To review the literature on rhabdomyosarcoma of the testis, epididymis, spermatic cord including all tumours that are referred to as para-testicular rhabdomyosarcoma. Method: Various internet data bases were searched. Results/Review: Rhabdomyosarcomas tend to represent primitive malignant round cell tumours that have skeletal muscle differentiation determined by immunohistochemistry and ultrastructural studies. Rhabdomyosarcomas of the testis, epididymis, spermatic cord and the para-testicular region are rare and they tend to represent about 7% of all rhabdomyosarcomas and about 6% of all para-testicular tumours. One out of about 20 million males in one year tends to develop these types of tumours. No preference for race or side has been established. These tumours tend to spread via the lymphatic system to iliac lymph nodes; nevertheless, spread via the blood stream to the liver and lungs do occur. These tumours most commonly tend to present as painless lump or mass within the testis/para-testicular region and the history tends to be short of few days to weeks duration. Occasionally patients may present with pain, fever, vomiting, and abdominal distension as well. On examination there tends to be a palpable lump related to the testis or epididymis, spermatic cord or para-testicular region and the lump could be inguinoscrotal. One third to half of these tumours may be associated with metastases. Diagnosis of a tumour within the testis, epididymis, spermatic cord or para-testicular region tends to be suspected on clinical examination, radiology imaging and this tends to be confirmed by means of histopathology examination an immunohistochemistry studies. Routine haematology and biochemistry test results tend to be normal and serum ß-HCG, AFP, and LDH tend to be normal. In some cases associated with liver metastases the liver function test results could be abnormal. Children and adults could develop the tumour. Ultrasound scan would tend to show a mass in the testis or para-testicular region with increased vascularity or mass compressing the testis. MRI scan could show a heterogeneously enhancing mass within the testis or a mass in the para-testicular region compressing the testis. CT TAP or MRI TAP could be utilized to stage the tumour. Treatment options tend to include surgical excision and chemotherapy; radiotherapy for local disease control could be offered; retroperitoneal lymph node dissection tends to be undertaken when there is radiology imaging evidence of lymph node enlargement. Gross examination of the specimen tends to show encapsulated, lobulated, smooth, grey-whitish tumour and these may have foci of haemorrhage, necrosis or cystic degeneration. Microscopic examination may show rhabdomyoblasts and undifferentiated primitive cells, tadpole cells, spindle cells and variable mitotic activity. Immunohistochemistry studies may show positive staining for Desmin, myoglobin, myosin, MSA, MyoD1, Myogenin, and rarely they may express cytokeratin. The outcome following treatment for localized disease tends to be better than when there are metastases. Poor prognosis tends to be related to age especially when he patients are aged less than one year or equal to or more than 10 years. Prognosis also tends to be affected by the classification of the tumour based upon the Intergroup Rhabdomyosarcoma Study Group’s International Classification of Rhabdomyosarcoma. Conclusion: Rhabdomyosarcoma of the testis, epididymis, spermatic cord including all tumours classified as para-testicular rhabdomyosarcoma are rare tumours with aggressive potential that tend to present with a short history; these tumours tend to be associated with normal tumour makers; diagnosis tends to be confirmed by the histopathology features and typical immunohistochemistry features (some of which include (positive staining for myogenin, desmin, actin, vimentin, and others as stated in the paper); treatment tends to be by means of surgical excision and chemotherapy; prognosis tends to be worse for advanced metastatic disease and in patients who are less than 1 year-old or equal to or greater than 10 years old as well as upon the classification of the tumour. Rhabdomyosarcoma of the testis, epididymis, and spermatic cord are rare malignant tumors that tend to be encountered sporadically globally. In view of the rarity of rhabdomyosarcoma of the testis and para-testicular region, it would be envisaged that many clinicians would not be familiar with the disease and they could possibly not be familiar with the biological behavior as well as the management of the disease. The ensuing review article on rhabdomyosarcoma of the testis, epididymis, and spermatic cord is divided into two parts: (A) Overview, and (B) Miscellaneous narrations and discussions from reported cases, case series and studies on rhabdomyosarcoma of the testis and para-testicular region. Definition/general comment: Rhabdomyosarcoma is a terminology which had been coined for a primitive malignant round cell tumor which has skeletal muscle differentiation evidenced by its immunohistochemistry features and by its characteristic ultrastructure. Sites: Generally, the majority of rhabdomyosarcomas of the testis/ epididymis/spermatic cord tend to be centered within the para-testicular soft tissue and there tends to be variability with regards to testicular involvement by a tumor. Pathophysiology: It has been stated that rhabdomyosarcoma of the testis/ epididymis/spermatic cord tends to generally spread via the lymphatic system into the iliac lymph nodes; nevertheless, spread by means of the haematogenous route into the lungs and liver also does occur. Microbiology investigations: Urine analysis, urine microscopy and culture tend to be undertaken in cases of rhabdomyosarcoma of the paratesticular and testis as part of the general assessment of patients with rhabdomyosarcoma of the testis/para-testicular region but the results would not be diagnostic of the disease but there is evidence of urinary tract infection then the infection tends to be treated appropriately. Hematology investigations: Full blood count, and coagulation screen tend to be undertaken as part of the general assessment of all patients but the results would tend not to be diagnostic of the disease; nevertheless, if there is any impairment of the hematology profile then this would b treated accordingly. Biochemistry investigations: Serum urea and electrolytes, serum glucose and liver function tests would tend to be normal in many cases but when there are extensive metastases to the liver, then there may be impairment of the liver function. If a patient is diabetic then the serum glucose results would enable clinicians to about the level of control of the blood sugar. Serum Beta Human chorionic gonadotrophin, serum alpha fetoprotein, and lactic dehydrogenase levels tend to be assessed as part of the general workup of testicular or scrotal masses and the results would tend to be within the normal range. Radiology investigations: Ultrasound scan of testes, scrotal contents, inguinal region, abdomen, and pelvis. • Tumour size with the largest diameter of greater than 5 cm (>5 cm). Intergroup Rhabdomyosarcoma Study Group’s International Classification of Rhabdomyosarcomas and related sarcomas. Pathologic aspects and proposal for a new classification-an Intergroup Rhabdomyosarcoma Study . Newton et al.,  stated that there was the need to develop a single prognostically significant classification of rhabdomyosarcoma (RMS) and other related neoplasms of children, adolescents, and young adults which would be a current guide for their diagnosis, allow valid comparison of outcomes between protocols that are carried out anywhere globally and should enhance recognition of prognostic subsets. Newton et al,  reported that 16 pathologists from eight different pathology groups, representing six countries and several cooperative groups, classified by four histopathologic classification schemes 800 representative tumors of the 999 eligible cases that had been treated on Intergroup Rhabdomyosarcoma Study II. Rypens et al.,  reported the unusual appearance of an infiltrating rhabdomyosarcoma (RMS) a tumour in a 3-year-old boy. A tumor did present as a thickening of the tunica vaginalis. The atypical ultrasound scan appearance and discordance with clinical features did raise the suspicion of a tumoral process which enabled early diagnosis and treatment. Kim et al.,  reported a 10-year-old boy who had presented with a painful swelling in his scrotum on the right side which had lasted for 2 to 3 days. On examination he was found have mild tenderness and erythema of the right hemi-scrotum on the right side. He had ultrasound scan of scrotum at presentation which was reported to have shown that the right epididymis had a massive swelling that measured 4 cm × 3 cm that had markedly increased vascularity and that was considered to be suspicious for the diagnosis of severe epididymitis with the need to diagnose an epididymal tumor mass as a differential diagnosis with an adenomatoid tumor being considered a possible differential diagnosis. He was put on antibiotics as a treatment for epididymal-orchitis and discharged home on antibiotics and to be followed up in case the symptoms had persisted. After two weeks his pain and scrotal swelling had persisted and hence he was admitted for further investigation and exploration of the scrotum. The results of his blood test did show mild leucocytosis and normal lactate dehydrogenase, alpha-fetoprotein, and beta human chorionic gonadotrophin. He underwent scrotal exploration which excluded an abscess, but this showed mild adhesion due to inflammation as well as a hard epididymal mass in the right hemi-scrotum. An excision biopsy of the mass was undertaken. The tissue specimen was not large enough for the pathologist to confirm a definite diagnosis but a provisional diagnosis of at least a low-grade sarcoma was made. He subsequently had computed tomography scan of thorax, abdomen, and pelvis which did not reveal any metastases. 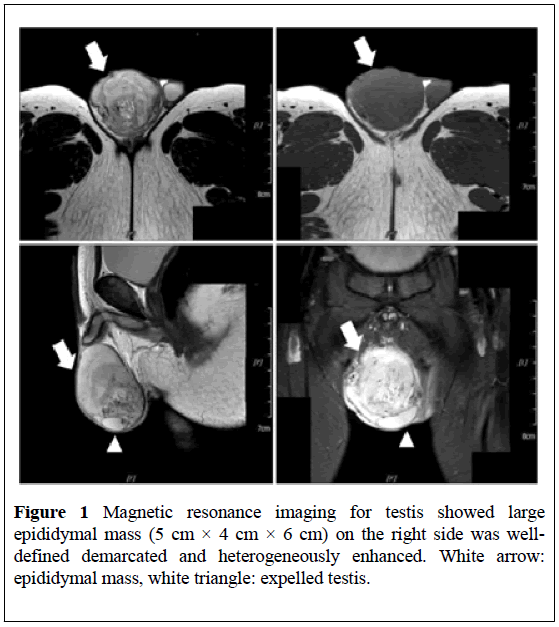 He had Magnetic Resonance Imaging (MRI) scan of the testis which did show a large epididymal mass that measured 5 cm × 4 cm × 6 cm on the right side and this was adjudged to be well-demarcated and it did have heterogeneous enhancement (Figure 1). He subsequently underwent right radical orchidectomy and Hemi-scrotectomy due to tumor invasion of the scrotal wall. The gross examination did show that the large epididymal mass was an enlarged and well-demarcated yellow-myxoid solid tumor that measured 5.5 cm × 4.5 cm with hemorrhagic change and focal necrosis. Normal testicular tissue was expelled peripherally (Figure 2). The tunica albuginea and the testis had not been invaded by a tumor and the surgical margins were free of a tumour. 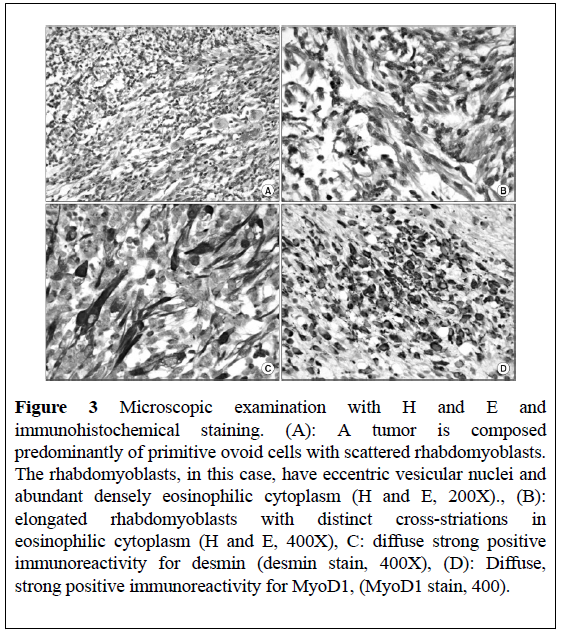 Microscopy examination of the specimen did show a highly cellular tumor which was composed of rhabdomyoblasts as well as pleomorphic cells with ovoid hyperchromatic nuclei and containing eosinophilic cytoplasm (Figure 3). Immunohistochemistry staining of a tumor did show that a tumor had exhibited diffusely and strongly positive staining for desmin and MyoD1. The patient was classified into group I of the Intergroup Rhabdomyosarcoma Study (IRS) due to the fact that there was no metastasis. He received 3 cycles of adjuvant chemotherapy (VAC regimen. At his 1-year follow-up, he was free of disease. Figure 1: Magnetic resonance imaging for testis showed large epididymal mass (5 cm × 4 cm × 6 cm) on the right side was welldefined demarcated and heterogeneously enhanced. White arrow: epididymal mass, white triangle: expelled testis. 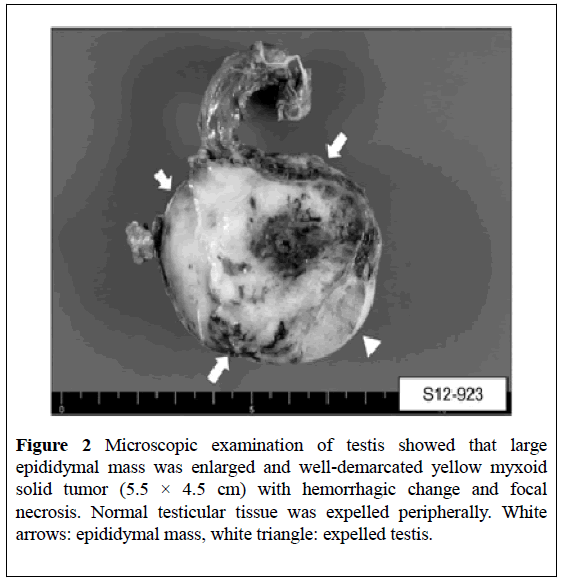 Figure 2: Microscopic examination of testis showed that large epididymal mass was enlarged and well-demarcated yellow myxoid solid tumor (5.5 × 4.5 cm) with hemorrhagic change and focal necrosis. Normal testicular tissue was expelled peripherally. White arrows: epididymal mass, white triangle: expelled testis. Figure 3: Microscopic examination with H and E and immunohistochemical staining. (A): A tumor is composed predominantly of primitive ovoid cells with scattered rhabdomyoblasts. The rhabdomyoblasts, in this case, have eccentric vesicular nuclei and abundant densely eosinophilic cytoplasm (H and E, 200X)., (B): elongated rhabdomyoblasts with distinct cross-striations in eosinophilic cytoplasm (H and E, 400X), C: diffuse strong positive immunoreactivity for desmin (desmin stain, 400X), (D): Diffuse, strong positive immunoreactivity for MyoD1, (MyoD1 stain, 400). Lee and associates  reported a 16-year-old boy who presented with a palpable mass of the left testis. He was asymptomatic otherwise. On examination, he was found to have a hard and mildly tender left scrotal mass. The results of his serum alpha-fetoprotein and serum beta human chorionic gonadotrophin levels were within normal range. He had scrotal ultrasound scan which showed left extra-testicular masses with compression of the left testis. He had Computed Tomography (CT) scan of abdomen and pelvis which did show a left, extra-testicular, soft tissue mass in the scrotum with external compression of the left testis and associated with central necrosis and no evidence of any definite lymphadenopathy or metastasis. He underwent left intra-scrotal excision of a tumor and left orchidopexy with preservation of his left testis and spermatic cord. Histology examination of the specimen did reveal alternating areas of dense compact cellularity and loose myxoid tissue. A final diagnosis of mixed embryonal and alveolar rhabdomyosarcoma was made and the surgical was free o tumor. He had a chromosomal analysis which was normal. He also had bone marrow examination which also did reveal normal cellularity with adequate megakaryocytes. He did receive combination chemotherapy pursuant to his operation that included vincristine, dactinomycin, and cyclophosphamide. He had follow-up CT scan of the abdomen and at the time of report of the case, there was no evidence of recurrent disease. Histology examination findings of the surgical specimen were reported to be consistent with results of the FNA. Valen et al.,  concluded that FNA represents a safe and accurate pre-operative procedure which is not associated with implications and FNA could be utilized in the outpatient setting which would enable a preliminary, pre-operative diagnosis, even for soft tissue tumors. Manwah et al.,  reported a 19-year-old gentleman who had presented with painless left scrotal mass and features of acute intestinal obstruction. The results of his serum alpha fetoprotein, beta human chorionic gonadotrophin and Lactic Dehydrogenase (LDH) were normal. He underwent laparotomy which revealed a small nodule in the sigmoid mesentery that was adjudged to be the cause of the obstruction. The nodule was excised and left orchidectomy was performed. Histopathology examinations of both specimens showed features of embryonal rhabdomyosarcoma. He was treated by means of chemotherapy but he died after 3 months. The immunohistochemistry staining features of a tumor were adjudged to be diagnostic of Embryonal Rhabdomyosarcoma (ERMS) of the testis. He had Computed Tomography (CT) scan of the brain which was normal. He had a course of adjuvant chemotherapy upon the advice from a multi-disciplinary team discussion having taken into consideration that a tumor was poorly differentiated. He had CT TAP at 3 months and his CT TAP images up to the time of the report of the case had not shown any evidence of metastasis or nodal recurrence. 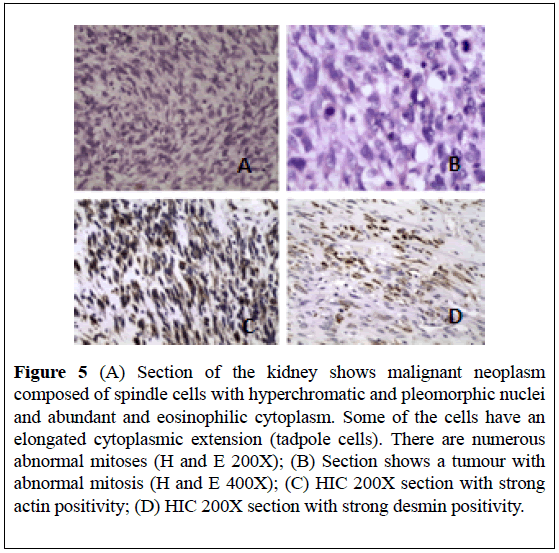 The strongly positive immunohistochemistry staining for Actin and Desmin was adjudged to be consistent with the diagnosis of rhabdomyosarcoma (Figures 4 and 5). He was discharged on the 14th postoperative day but was lost to follow-up and attempts to find him had failed. Lessons to learn from this case report include: Rhabdomyosarcoma of the testis could occasionally be associated with a synchronous rhabdomyosarcoma elsewhere in the body; nevertheless, in view of the fact that staging computed tomography scans of the thorax, abdomen, and pelvis tend to be undertaken for the full assessments of patients who have rhabdomyosarcoma of the testis it should be unlikely these days that globally a synchronous rhabdomyosarcoma elsewhere in the body would be missed; the fact that the reported patient was missed from follow-up should be evidence for clinicians to take steps to ensure that patients with rhabdomyosarcomas and other malignant tumors should be thoroughly counseled in hospital before they are discharged and the contact details of the patients and their next of kin’s should be well documented as well as the patients should be provided with the contact details of a responsible nurse that would provide support to each patient any time. 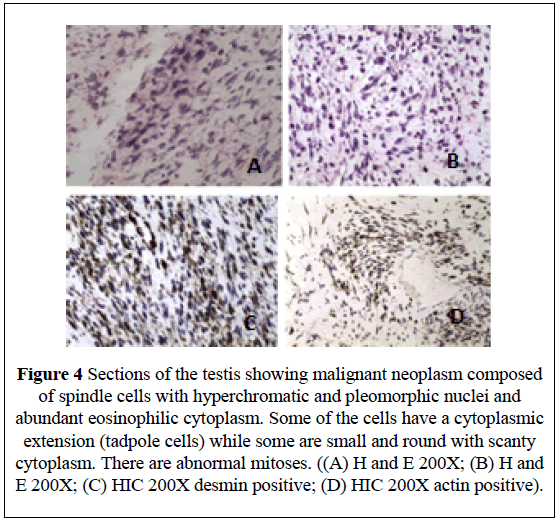 Figure 4: Sections of the testis showing malignant neoplasm composed of spindle cells with hyperchromatic and pleomorphic nuclei and abundant eosinophilic cytoplasm. Some of the cells have a cytoplasmic extension (tadpole cells) while some are small and round with scanty cytoplasm. There are abnormal mitoses. ((A) H and E 200X; (B) H and E 200X; (C) HIC 200X desmin positive; (D) HIC 200X actin positive). Figure 5: (A) Section of the kidney shows malignant neoplasm composed of spindle cells with hyperchromatic and pleomorphic nuclei and abundant and eosinophilic cytoplasm. Some of the cells have an elongated cytoplasmic extension (tadpole cells). There are numerous abnormal mitoses (H and E 200X); (B) Section shows a tumour with abnormal mitosis (H and E 400X); (C) HIC 200X section with strong actin positivity; (D) HIC 200X section with strong desmin positivity. Delto et al.,  reported a 24-year-old man who had presented with a painless right scrotal mass of 3 weeks duration. He was found on examination to have a non-tender right epididymal mass which had measured about 1 cm. He had a scrotal ultrasound scan which showed a small mass in his right epididymal tail that had questionable vascularity. Both his testes were normal. He was placed on surveillance with the provisional assumption that the lump was a benign lesion. At his 3 months follow-up, it was discovered that the lump had enlarged. He then had a repeat ultrasound scan of the scrotum which had shown enlargement of the right epididymal tail lesion together with 2 new additional lesions that measured up to 3 cm. The surgical resection margins were clear of a tumour. The aforementioned findings were adjudged to be consistent with a final diagnosis of T1N0M0 para-testicular rhabdomyosarcoma of the spindle cell type. The patient was offered the option of radical inguinal orchidectomy and ipsilateral nerve sparing lymph node dissection followed by chemotherapy upon the advice of the medical oncologist; nevertheless, the patient refused to undergo any further surgical operation but he did agree to have chemotherapy which had been initiated at the time of the report of the case. There was no long-term follow-up outcome of this case. Clinicians always need to accept patients a choice of self-determination after careful explanation of all treatment options available. The reported patient was advised to undergo radical orchidectomy and ipsilateral nerve sparing lymph node dissection as an additional precaution to provide treatment of curative intention after having taken into consideration the surgical margins were negative of a tumour and this surgical operation was to be followed by chemotherapy. Nevertheless, the patient declined to undergo any further surgery. The clinicians in this case correctly accepted the choice of the patient. It could be argued that chemotherapy pursuant to excision of the lesions with preservation of the right testis and spermatic cord followed by chemotherapy is a good alternative treatment of curative intent with regards to this case scenario. Nevertheless, it could be argued that the drawback with regards to the case report was published too early without waiting for the intermediate term and long-term outcome in that there it cannot be ascertained with regards to the case whether or not the surgical excision of the lesions with clear margin followed by chemotherapy was adequate treatment with long-term outcome. Based upon this anecdotal case report it would be argued further that the best way to determine whether surgical excision of para-testicular rhabdomyosarcoma with preservation of the testis and spermatic cord followed by chemotherapy does achieve similar long-term outcome as treating a para-testicular rhabdomyosarcoma by local excision plus radical orchidectomy plus ipsilateral lymph node dissection followed by chemotherapy, there would be the need to establish a large-scale multicentre study that would compare the two forms of treatment in order to establish a consensus opinion on the treatment options. Ipsilateral lymph node dissection and radical orchidectomy would provide apparent greater morbidity in comparison with local excision of the para-testicular lesion that has the additional advantage of preservation of the testis. Rhabdomyosarcoma of the testis, epididymis, spermatic cord including all tumors classified as para-testicular rhabdomyosarcoma are rare tumors which have an aggressive potential which does present with a short history; these tumors generally are associated with normal serum tumor marker levels; diagnosis tends to be confirmed by the histopathology features of the tumors and typical immunohistochemistry features of the tumors (positive staining for myogenin, desmin, actin, vimentin, and others as stated in the paper); these tumors are generally treated by means of surgical excision and chemotherapy and radiotherapy would be given for local control of disease; prognosis tends to be worse for advanced metastatic disease and in patients who are less than 1-year-old or equal to or greater than 10 years old as well as upon the classification of a tumor. Ferrari A, Bisogno G, Casanova M, et al. Paratesticular rhabdomyosarcoma: report from the Italian and German Cooperative Group. J Clin Oncol 2002;20:449-55. Keskin S, Ekenel M, Basaran M, et al. Clinicopathological characteristics and treatment outcomes of adult patients with paratesticular rhabdomyosarcoma (PRMS): A 10-year single-centre experience. Can Urol Assoc J 2012;6:42-5. Kumar R, Kapoor R, Khosla D, et al. Paratesticular rhabdomyosarcoma in young adults. A tertiary care institute experience. Indian J Urol 2013;29:110-13. Ferrari A, Casanova M. Current therapeutic strategies for rhabdomyosarcoma. Expert Rev Anticancer Ther 2005;9:283-294. Raney RB, Mauner HM, Anderson RJ, et al. The Intergroup Rhabdomyosarcoma Study Group (IRSG): Major lessons from the IRS-1 through IRS-IV studies as background for the current IRS-V treatment protocols. Sarcoma 2001;5:9-15. Terezakis SA, Wharam MD. Radiotherapy for rhabdomyosarcoma: indication and outcome. Can Oncol (R Coll Radiol) 2013;25:27-35. Breneman CJ, Lyden E, Pappo AS. Prognostic factors and clinical outcomes in children and adolescents with metastatic rhabdomyosarcoma-A report from the intergroup rhabdomyosarcoma study IV. J Clin Oncol 2003;21:78-84. Newton W A Jr, Gehan EA, Webber B L, et al. Classification of rhabdomyosarcoma and related sarcomas. Pathologic aspects and proposal for a new classification-an Intergroup Rhabdomyosarcoma Study. Cancer 1995;76:1073-88. Breneman JC, Lyden E, Pappo AS, et al. Prognostic factors and clinical outcomes in children and adolescents with metastatic rhabdomyosarcoma-a report from the Intergoup Rhabdomyosarcoma Study IV. J Clin Oncol 2003;21:75-84. Rypens F, Garel L, Frano-Guimond J, et al. Paratesticular rhabdomyosarcoma presenting as thickening of the tunica vaginalis. Pediatr Radiol 2009;39:1010-12. Kim YJ, Huh JS, Hyun CL, et al. A case of pediatric paratesticular rhabdomyosarcoma with epididymitis The World Journal of Men’s Health 2012;30:146-49. Lee HY, Tsai CC, Huang CH, et al. Mixed-type paratesticular rhabdomyosarcoma-A case report. Kaohiung Journal of Medical Sciences 2011;27:239-41. Valen RM, Papanikolaou A, Panagiolou A, et al. A rare case of paratesticular rhabdomyosarcoma diagnosed by fine needle aspiration: a case report. Acta Cytol 2009;53: 319-22. Manwah N, Marwah S, Gill M, et al. Adult Paratesticular Rhabdomyosarcoma Presenting as Acte Intestinal Obstruction-A case report. Indian J Surg 2013;75:143-44. Kelly B, Lundon D, Rowaiye B, et al. Embryonal rhabdomyosarcoma of the testis. Can Urol. Assoc Urol J 2011;5:E7-E10. Duduyemi BM, Yifieyeh AC, Afihene MY. Synchronous rhabdomyosarcoma of the testis and kidney. A case report and review of the literature. Alexandria Journal of Medicine. 2016;52:193-196. Delto JC, Wayne GF, Garces S, et al. An adult case of paratesticular spindle cell rhabdomyosarcoma. Urology Case Reports 2014;2:126-8.